Here are 54 short tunes for each card. Each Ace melody is a sassy quick catchy theme. The 2s are quiet and tender. The 3s are lovely and expansive. The 4s are intelligent and intricate. The 5s are slow and beautiful. The 6s are romantic and pensive. The 7s are interesting and involved. The 8s are poignant and delicate. The 9s are mysterious and dramatic. The 10s are spicy and fun. The Jacks have a jazz flavor. The Queens are amazing and touching. The Kings are majestic and regal. The Colorful Joker is very whimsical and playful. The Black and White Joker is the grand Finale! Tampa Bay, Here I come! I’m looking forward to going to visit my P.E.O. sisters in Tampa Bay, Florida and giving a concert on February 17th. This will be the third state that I perform the Founder’s Program, Washington and Pennsylvania being the other two. An additional bonus is that I will be staying with a descendant of Alice Bird Babb, one of the founders! These ten dramatic piano solos capture the essence of beloved characters in literature. gallop of spirited Jo, to the sophisticated beauty of Meg, these songs emulate The Little Women. Minnehaha, Evangeline and Ramona works unfold their epic tragedies. 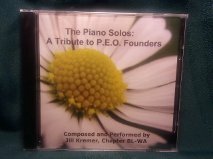 And finally, from The Yearling, from a delicate cripple neighbor boy to the giant grizzly bear, to the daunting storm, these spectacular piano works will leave the listener inspired. being played at initiations and many of these songs have been played at State Conventions! Ta Dah! This powerful final wave of this series smacks of Victory! I hope you enjoyed the music and artwork. followed by a full sweep up to a victorious descent. a riveting chase scene, ending with huge crashing sounds. crafted peak which cascades it way down to an obstinate finish.